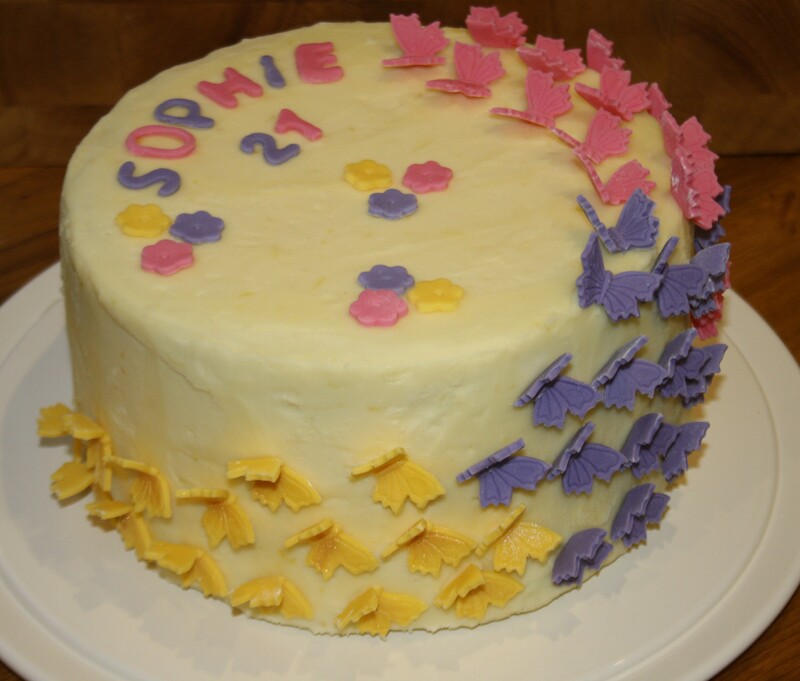 This week, the last of my housemates turned 21, so it was my last opportunity to bake a wow-factor cake. She put on a lovely dinner party for couple of friends and I told her I would provide a cake. For at least 3 months now I have wanted an occasion to bake a Pinata cake after seeing them on pinterest, so I leapt upon the opportunity. For those who don’t know, a pinata cake is literally a pinata made of cake…. 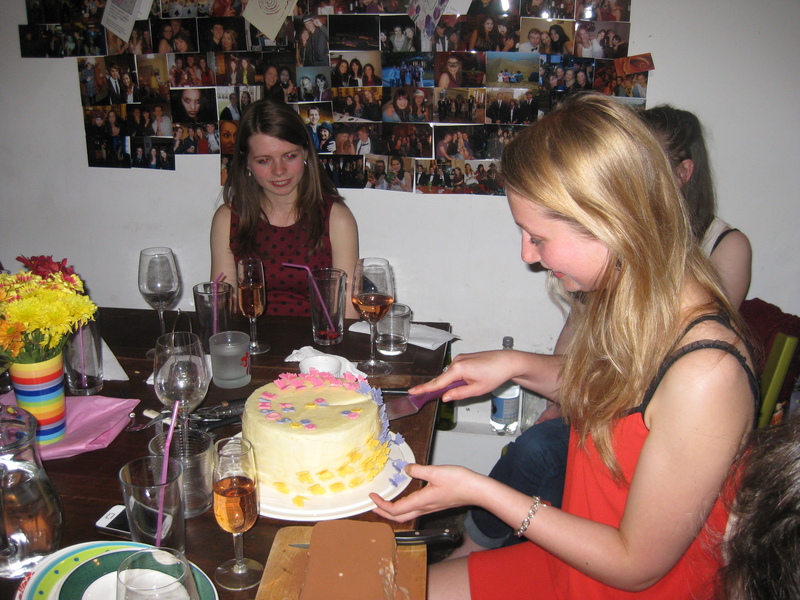 A cake that, when you cut into it (NOTE CUT, NOT HIT – if anyone had tried to hit it with a stick i would have cried), spills sweets onto your table. A pretty spectacular sight and definitely worthy of a 21st. I did quite a bit of research before starting and came across several methods for assembling the cake. The easiest way is to cook 2 cakes, scoop out the centre of both (but not all the way through to the bottom), mound up the sweets in the middle of the bottom cake and then place the other, upturned, on top. I made a 6 egg batter (6 eggs, 340g margarine, 340g caster sugar, 340g self raising flour, 3tsp baking powder and a few tablespoons of milk) and split the batter between two 8 inch cake tins. I decided to make a classic lemon cake, so added the zest of 1 large lemon to the mixture. I baked these at 160 (fan) for about 45 minutes. As these are big cakes, i wasn’t sure how long they were going to take to cook, so unfortunately I did open the door of the oven to check on them slightly too early (big baking faux pas). In hindsight, the sponges were very deep, and they couldn’t quite support themselves, so they sank slightly in the middle. If I made this cake again, I think I would split the batter into 3 tins to avoid this. I took each of the two cakes and cut them in half horizontally, so that I had 4 cakes in total. I then cut a hole out of the middle of two of these cakes with a circular biscuit cutter, to create the hole for the smarties (my chosen pinata centre). I made a lemon drizzle icing which I put over all the sponges to give it an extra lemon zing, and then spread them with a layer of lemon curd. If you use a coarse sugar for the lemon drizzle then you get a lovely, crispy icing which adds a bit of texture to the sponge. I assembled the cake as lesliebeslie has photographed in her blog, and before adding the top layer I filled it with smarties. I decided just to use the pink, yellow, purple and green smarties, as this was going to fit in with the colour scheme I had planned for the exterior decoration. My little niece had great fun sorting through to find the colours, especially when she realised I definitely didn’t want the brown ones – she helpfully ate every single one! To give an idea of quantity, I bought 12 tubes of smarties which was plenty for the 4 colours I needed. I probably had about 3 tubes left at the end so if you were using all the colours you would probably only need 9 tubes. A word of warning – sweets like smarties, m&ms etc, do bleed their colour – I was aware of this, so tried not to get any lemon drizzle or lemon curd directly in contact with the smarties. However, the colour did leak a bit into the sponge and the smarties did go slightly soft. If you need to make this cake well in advance I would recommend using either chocolates without a sugar coating or wrapped sweets (although not too big as the cake becomes difficult to cut!) . Alternatively, if you put buttercream between the layers instead of lemon curd it would be less likely to ooze moisture into the centre. Once the hole has been filled you can pop the top on and start icing the outside. I made the basic buttercream recipe but increased the quantity to 250g butter/500g icing sugar, and the zest of a large lemon – this made enough to cover the entire of the outside. To get a really good finish on a cake, you need to do the butter icing layer by layer. Don’t try to put it all on at once, otherwise you will draw up the outside of the cake and the finished product will be littered with crumbs. 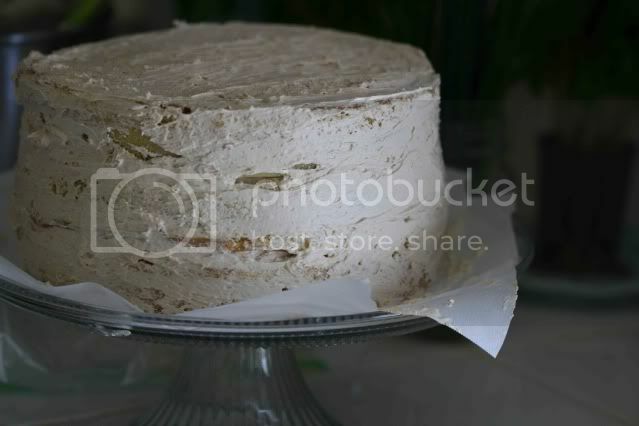 First, do a crumb coat by taking about a third of the buttercream and covering the entire cake with a thin layer. This will look messy (somewhat like this) but if you put the cake in the fridge then remove it when the icing has set to do the next layer of buttercream, it creates a much smoother result. I added two more layers on top of my crumb coat but you may find you only need one. After the last layer, let the buttercream set so it is no longer tacky, and then you can gently pat down any less smooth areas. To make the butterflies, I coloured regalice icing to match the colours of the smarties using lakelands gel icing colours. I then cut them out using this cutter which allows you to create a lovely imprint. I left the butterflies to dry out over the edge of a chopping board so that they would become 3D. 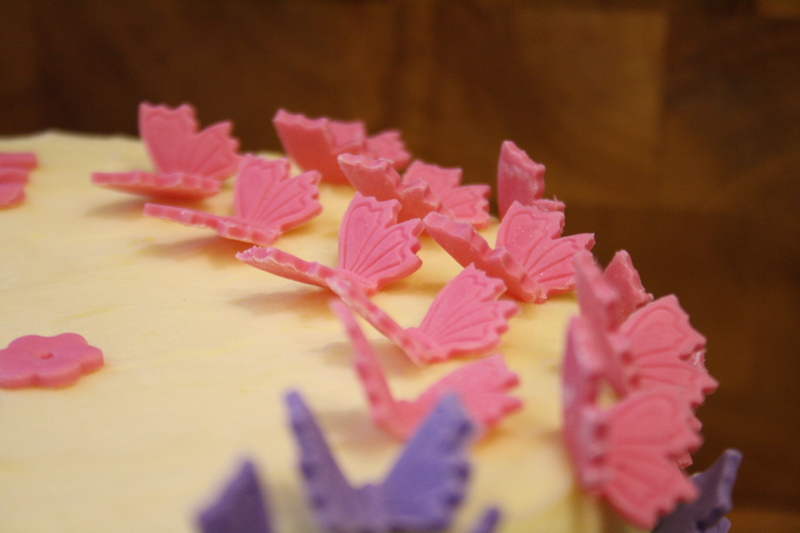 It didn’t take too much pressure to get the butterflies to stick to the cake, but it was a very nerve-wrecking job. They are very delicate, so make sure you make more than you need as some will inevitably break. 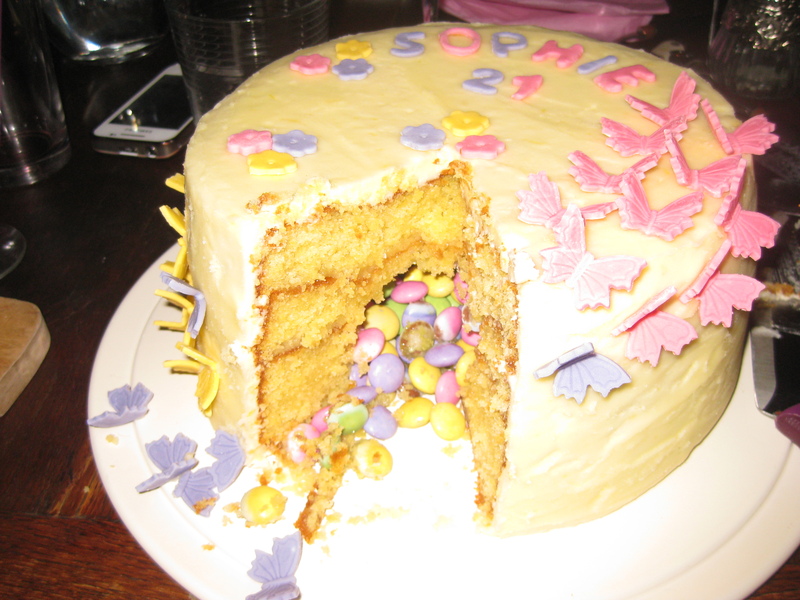 Cutting into the cake was also nerve-wrecking as I had no idea how the smarties would have fared, but it looked brilliant and is definitely a cake I would make again. Birthday girl cutting into her cake! 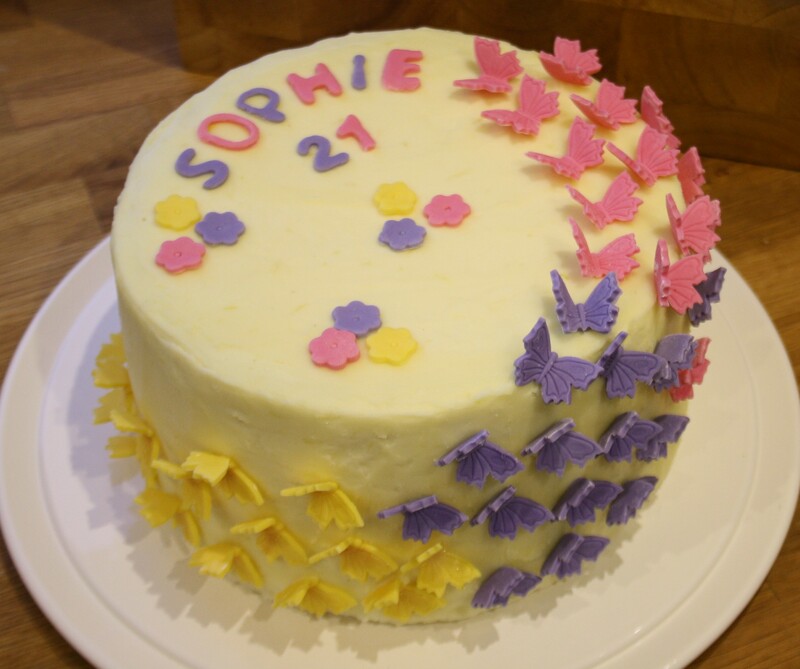 I would definitely say that this cake is easier than it looks and even the most amateur of bakers could give it a go! ‘Looks amazing’ is my comment. My name is Jan Lynn and I’m the junior acquisitions editor here at Alpha Books, an imprint of Penguin Random House. I’m currently looking for candidates interested in authoring a book about Hidden Surprise Cakes and found you through pins on Pinterest. Would you be interested in speaking to me more about this interesting project? Please email at janette.lynn@dk.com and we can continue talking about this opportunity.